‍Prisoners of War taken to the Japanese home islands were no better treated than the many areas being held under the IJA (Imperial Japanese Army) The voyage itself was the most terrible ordeal. One prisoners who was moved from Java to Japan (via Singapore, Saigon and Taiwan) recorded that one man in three died during the voyage. The risk of being torpedoed grew as the journey of many weeks continued. Around October 1942, eight months after capitulation, more than 1,000 men were shipped from Java to Singapore and then onto Japan. 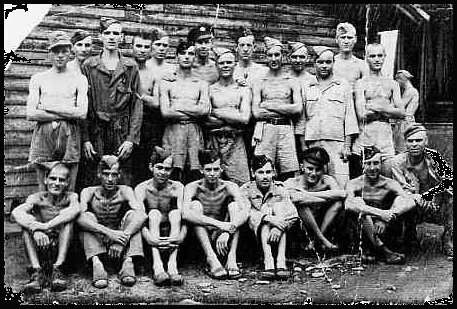 More than a year later, on the completion of the Thai/Burma railway, thousands more men were sent back to Changi from Thailand and found themselves being jammed onto one of the many "hell ships" and their destination was also Japan. These ships, commonly called "rust buckets" were hardly sea worthy let alone fit to take large numbers of men across the China Sea, men who were already suffering badly in every way. The ships were badly ventilated, the men were crammed into the holds and many were to die during the journey, or if they survived, many died shortly after their arrival in Japan. The camps in Japan were widely distributed over six main areas, each saturated with prison camps and usually attached to some industry or near the wharves and large ports. In the north was Hakodate and in the south, Fukuoka and Hiroshima and in the central areas could be found Osaka, Sendai, Tokyo and Nagoya. Due to the vast numbers of men constantly being shipped from other places ie. Singapore, Java and Sumatra ( often via Taiwan) some camps overflowed and a Camp No 2 was set up. From the tropical climates to suffocating filthy holds, the prisoners were then faced with the icy weather and sub zero winters that Japan now offered them. Many were still in what few light clothes they possessed, although the temperature within the prison barracks was subzero and the snow at times was 16 feet deep. POWs were forbidden to wear greatcoats. Lice and fleas infested the camps, bringing diseases associated with them. the luxury of warm clothing was not issued until some time later. One such camp was Kawasaki, where the POWs worked in the shipyards at Kobe, this camp like all other was infested with bugs and lice. In some camps there was no medical officers, such was the Kobe camp and 120 prisoners died from lack of medical treatment and injuries received through ill treatment at the hands of the Japanese. Some POWs were lucky enough to be taken to the Kobe POW hospital, some were admitted to the hospital at Osaka, but this had a reputation of being an "extremely cold and cruel place" where the badly ill patients died of starvation. A dockside work camp at Yokohama consisted of a large goods shed fitted with wooden platforms on which several hundred prisoners of all ages and nationalities slept. In keeping with other camps this was infested with rats, lice and fleas. Zentsuji Camp in the southern part of Japan was one of the few designed to accommodate prisoners of war, but it was cramped, due to the very large numbers with very poor unsanitary conditions. As with the many other areas holding thousands of POWs, the lack of food was very acute. The food shortage in Japan weighed just as heavily on the civilian population as it did on the prisoners and often Red Cross parcels delivered for the POWS were pilfered by the hungry guards. If questioned they would say "everything belonging to the prisoners of war was legally the property of the Japanese Government"
However it was not only the Japanese who were the enemy. When allied aircraft started dropping their bombs, it was sometimes onto unfortunate prisoners on the ground who became the victims. Able bodied men (such as they were) carried their wounded comrades on stretchers back to the Kawasaki camp when Kobe was hit. Frequent and increasing air raids made everyone very jumpy and nervous, including the Japanese, and prisoners and captors received little sleep during the regular night raids. The prisoners also feared reprisals from the Japs when the Allies started dropping bombs. The tense Japanese enforced ridiculous regulations to try and make the prisoners realise that they were still very much in command.